Forget the hackneyed hotel room!! We will provide you with a personal guide / skipper to take you both for a 2 hour twilight sail to see the beauty of Sydney Harbour, before leaving you alone on a safe mooring for the evening. 5.30pm – Your skipper welcomes you aboard, cast off & see all the lights under sail. A Seafood platter for 2, featuring lobster, prawns, freshly shucked oysters There is also a garden salad, chicken soba noodle salad, bread, strawberries and chocolates. Non seafood menus available. Light Breakfast basket of pastries and yoghurt, tea & coffee. You are welcome to bring CD’s, snacks or other drinks — or we can arrange this for you. 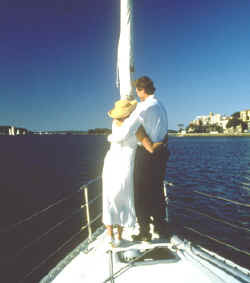 Located just 1.5 hours north of Sydney, yet a world away from care, you and your partner will begin a unique on water accommodation delight. You and your partner will board, Lasal, our 38ft Bavaria which has three double cabins, fully equipped galley, CD player, on deck BBQ and bathroom with hot / cold shower. The yacht also has a lot of weather shelter including a bimini and dodger making your time aboard enjoyable in all weather conditions. Take the helm or sit back and relax as your skipper sails you and your partner out past spectacular Lobster Beach and Iron Ladder (stopping for a swim if you wish). You will sail past Lion Island and down into the Hawkesbury River. After 3 hours of sailing, your skipper will bring you back into Hardys Bay to be safely moored for the night. Your skipper will then run you through the workings of the yacht and leave you to enjoy a succulent seafood platter (or alternative) for dinner and a romantic night below deck. There is nothing better than sipping champagne under the stars and listening to the water lap all around you. Your skipper will return for you the following morning after you have cooked and enjoyed your hearty breakfast (provided). The skipper will then bring you safely back into the wharf. Cost:$795 1st couple $150 per person after that.